I was just thinking about my experience with 'Carrie' and yours with your room mate... good job nipping it in the bud. Yes you did endure two nights of very poor companionship but at least speaking up allowed your roomie to amend her ways. It would be a shame when everything else concerning the hospital stay was satisfactory to have no sanctuary for yourself in your own room. Thank goodness you were able to get that tumour removed... what a horrifying experience you must have had watching it grow. As always, you inspire me with what you have lived through! Thanks for sharing great information about Cosmetic Breast Surgery Tips & Information with us. Dr. R. Berman is a certified cosmetic, plastic & reconstructive surgeon in Boca Raton. 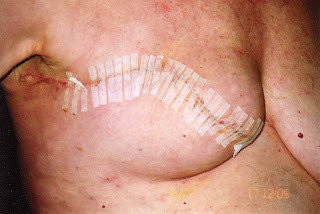 Find best Breast Surgeon Boca Raton & all of South Florida. Chez wasn't expected to see what i saw,it grew real fast and at first until i read wasn't sure that it was after surgery..Chezzy you sure have been though so much and still are and i always wrap my arms around you,praying for your pain to go away and heal you. Chez, it is brave and necessary to relive this experience and be reminded of the horror that engulfed you. I hope that there is an end to this story, that you are strong, phoenix raising from these ashes. I write my own blog to remind myself that just last July I was so very near to the cliff. Kaz you know I could never work out why my Mother called me 'The black sheep of the family.' Is it because I dare to be different or maybe just the ability to make the best out of what has been given to me? Were my words sufficiently clear for you to understand that was my breast tumour, measuring over 6cm, growing on the outside of my breast? Most of the pics were unsuitable for public viewing here. Is it any wonder I still wonder the purpose for my being..
Sending love, light and lots of laughtert. Sent Sami the link to the video clip from downtown Maine. Not sure exactly wherwe she is my friend. StonePost I have a grin a mile wide as I reply to you. Posting these pics I thought of you, my one and only male reader, knowing this is not a pretty sight. I have exposed myself haha. Warts and all! You must certainly be smiling also. This is all for a good cause and I really appreciate your words which give me encouragement and HOPE. Just what is needed these days. My worst night in hospital was the night my IV machine beeped EVERY 10 MINUTES! But I think having your roomy making personal calls at bedtime would have been worse! Much worse! WhiteStone a beep every 10 minutes would have been more than I could handle. At least my 'companion' did get off the phone before sunrise. I've been traveling, and just found your recent posts. You've been on my mind. I should have found a computer and gone online to check on you, but I didn't. This tumor on the outside of your breast... My heart breaks that you're going thru this. Your grace and beauty clings to every word you write. Please know how much I think about you, pray for you and wish I were there to do what... I don't know, but I'm nearly compelled to come. Instead, I release you to God's care and pray for you, daily. I found Starry's blog and left a comment there. Thank you for stopping by my blog and leaving a comment. I have just been reading yours and I applaud your courage to write about your cancer and your grief....I'm so sorry for the loss of your son. Losing a child is like having a piece of you amputated. We do have similar stories...my beautiful mum had breast cancer at 45 and went through similar surgery to you. It was a heartbreaking time for her to lose part of her womanhood however she survived for another twenty years then got ovarian cancer....so to me her breast cancer was cured. Sending love in the message, I'll look forward to reading about your journey Chez, I know after losing our daughter and my sister and mum, grief can be overwhelmeing! I will keep you in my thoughts. Sweet Brenda, the tumour was removed in 2005 which means I have passed the '5 year survival' thing. The fact that you were travelling means that you bring so much more to your blog entries. While you are learning and sharing I am digging deep into the memory bank. As you know life at the farm tends to leave me in a situation with little of interest daily. That is where you come in my sweet. You are the 'icing' on my cake. My motivation to reflect and write about lessons learned along life's path. Diana having just come from your blog I cannot help but smile as I know from experience it allows me to feel better on the inside. Unsure where your sister had the accident, although you did mention it was not too far from Bairnsdale. You are so right about 'coincidences.' I did a post on the subject recently. It seems our paths were destined to cross. Do you have a memorial website for Savannah? Diana,look forward to learning more. Thank you for visiting and also signing up as a Follower. What a horrible experience for you.It is good therapy to write about it. Congrats for getting to the 5 year benchmark. Shame that you are still in pain. Thanks for your lovely quote on my blog! Its comforting to know others understand our pain. My sister Tarnia was killed on the Seaspray Road which is about an hour from Bairnsdale. My husbands parents live in Bairnsdale. After reading your feelings after your boys accident it gave me goosebumps as I felt the same sort of emotions after Tarnia died. I had her twin daughters stay with me last night and its so heartbreaking to know they will never know their mum! Chez: I cannot cease to wonder at and respect your bravery: not only did you live through all these things - you share your story to give hope and inspiration to all. Diane, the 5 year mark seems to be a milestone. Especially given that I lost my child during that time. Diana, I am still in awe at our 'connection' Are you currently in Australia? If so, maybe I could ring you. Mm seem I did not have a choice. I could have curled up in the fetal position and had a miserable life. Just did not seem to be my style.